Do you have to manage many WordPress sites, either for your clients or blogs that are your own? If so you certainly know how much time that can take on a daily basis. Time that is spent on mundane administrative tasks and then missing from your important business tasks. CMS Commander is an online service that aims to solve this problem and make managing multiple WordPress weblogs as fast and easy as controlling a single site. By placing all your weblogs into one powerful dashboard CMS Commander makes it possible to update, backup and manage them all in bulk at the same time. While CMS Commander can be used for free a premium account will give you access to several special features and allows you to manage more websites. 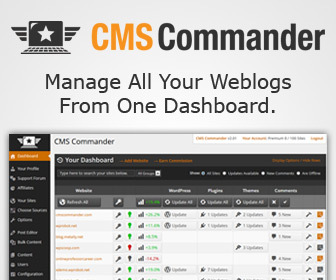 Sign up for a free account on cmscommander.com now to start controlling all your weblogs from one dashboard and enjoy the best way to manage multiple WordPress sites!